Not to be confused with the inland modern city of Roanoke, Virginia. "Lost Colony" redirects here. For other uses, see Lost Colony (disambiguation). Virginea Pars map, drawn by John White during his initial visit in 1585. Roanoke is the small pink island in the middle right of the map. The Roanoke Colony ( /ˈroʊəˌnoʊk/), also known as the Lost Colony, was the first attempt at founding a permanent English settlement in North America. It was established in 1585 on Roanoke Island in what is today's Dare County, North Carolina. The colony was sponsored by Sir Walter Raleigh, although he himself never set foot in it. The initial settlement was established in the summer of 1585, but a lack of supplies and bad relations with the local Native Americans caused many of its members to return to England with Sir Francis Drake a year later, leaving behind a small detachment. These men had all disappeared by the time a second expedition led by John White, who also served as the colony's governor, arrived in July 1587. White, whose granddaughter Virginia Dare was born there shortly thereafter (making her the first English child born in the New World), left for England in late 1587 to request assistance from the government, but was prevented from returning to Roanoke until August 1590 due to the Anglo-Spanish War. 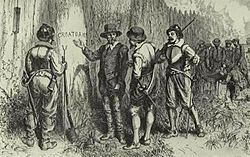 Upon his arrival, the entire colony was missing with only a single clue to indicate what happened to them: the word "CROATOAN" carved into a tree. For many years, it was widely accepted that the colonists were massacred by local tribes, but no bodies were ever discovered, nor any other archaeological evidence. The most prevalent hypothesis now is that environmental circumstances forced the colonists to take shelter with local tribes, but that is mostly based on oral histories and also lacks conclusive evidence. Some artifacts were discovered in 1998 on Hatteras Island where the Croatan tribe was based, but researchers could not definitively say these were from the Roanoke colonists. A watercolor by John White of the fort in Guayanilla Bay in Puerto Rico, which is likely similar to the fort constructed on Roanoke. The queen's charter also said that Raleigh was supposed to establish a base from which to send privateers on raids against the treasure fleets of Spain. :135 The purpose of these raids was to tell Spain that England was ready for war. The original charter basically told Raleigh to establish a military base to counteract the activities of the Spaniards. Raleigh himself never visited North America, although he led expeditions in 1595 and 1617 to South America's Orinoco River basin in search of the legendary golden city of El Dorado. On April 27, 1584, Raleigh dispatched an expedition led by Philip Amadas and Arthur Barlowe to explore the eastern coast of North America. 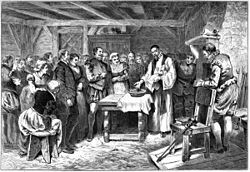 They arrived on Roanoke Island on July 4 :32 and soon established relations with the local natives, the Secotans and Croatans. Barlowe returned to England with two Croatans named Manteo and Wanchese, who were able to describe the politics and geography of the area to Raleigh. :44–45 Based on the information given, Raleigh organized a second expedition, to be led by Sir Richard Grenville. Grenville's fleet departed Plymouth on April 9, 1585, with five main ships: Tiger (Grenville's), Roebuck, Red Lion, Elizabeth, and Dorothy. A severe storm off the coast of Portugal separated Tiger from the rest of the fleet. :57 The captains had a contingency plan if they were separated, which was to meet up again in Puerto Rico, and Tiger arrived in the "Baye of Muskito"  ( Guayanilla Bay) on May 11. While waiting for the other ships, Grenville established relations with the resident Spanish while simultaneously engaging in some privateering against them. :62 He also built a fort. Elizabeth arrived soon after the fort's construction. :91 Grenville eventually tired of waiting for the remaining ships and departed on June 7. The fort was abandoned, and its location remains unknown. Once the Jamestown settlement was established in 1607, efforts were undertaken by the English to acquire information from the Powhatan tribe about Roanoke. The first definitive information concerning the fate of the Lost Colony came from Captain John Smith, leader of the Jamestown Colony from 1608 to 1609. According to chronicler Samuel Purchas, Smith learned from Chief Powhatan that he had personally conducted the slaughter of the Roanoke colonists just prior to the arrival of the Jamestown settlers because they were living with the Chesepians, a tribe living in the eastern portion of the present-day South Hampton Roads sub-region who were related to the Pamlico tribe in Carolina and who refused to merge with the Powhatans. :21–24 This shocking information was reported to England and by the spring of 1609, King James and the Royal Council were convinced that Chief Powhatan was responsible for the slaughter of the Lost Colony. However, the case was far from settled. A similar legend claims that the now extinct Saponi of Person County, North Carolina, are descended from the English colonists of Roanoke Island. However, no documented evidence exists to link the Saponi to the Roanoke colonists. In 1998, a team led by climatologist David W. Stahle, of the University of Arkansas and archaeologist Dennis B. Blanton of the College of William and Mary used tree ring cores from 800-year-old bald cypresses taken from the Roanoke Island area of North Carolina and the Jamestown area of Virginia to reconstruct precipitation and temperature chronologies. 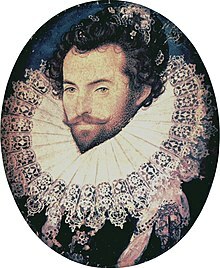 ^ "Charter to Sir Walter Raleigh March 25, 1584". University of Groningen. Retrieved January 5, 2013. ^ a b c d e f g h Quinn, David B. (February 1985). Set Fair for Roanoke: Voyages and Colonies, 1584–1606. UNC Press Books. ISBN 978-0-8078-4123-5. Retrieved June 3, 2011. ^ http://www.designhammer.com, Website graphic design and web development by DesignHammer Media Group LLC, Building Smarter Websites. "North Carolina History Project : Roanoke Island". www.northcarolinahistory.org. Retrieved February 29, 2016. ^ a b c d e f g h i Kupperman, Karen Ordahl (January 25, 1984). Roanoke, The Abandoned Colony. Rowman & Littlefield. ISBN 978-0-8476-7339-1. Retrieved June 3, 2011. ^ Campbell-Dollaghan, Kelsey. "New Discoveries Could Explain What Happened to the Lost Colony of Roanoke". Gizmodo. Retrieved February 29, 2016. ^ "Teacher Handbook to Roanoke Revisited". Fort Raleigh National Historic Site. National Park Service. Retrieved July 10, 2011. ^ a b Milton, Giles (October 19, 2001). Big Chief Elizabeth: The Adventures and Fate of the First English Colonists in America. Macmillan. ISBN 978-0-312-42018-5. Retrieved July 10, 2011. ^ a b c Blacker, Irwin (1965). Hakluyt's Voyages: The Principle Navigations Voyages Traffiques & Discoveries of the English Nation. New York: The Viking Press. p. 522. ^ Lane, Ralph. "The Account by Ralph Lane. An account of the particularities of the imployments of the English men left in Roanoke by Richard Grenville under the charge of Master Ralph Lane Generall of the same, from the 17. of August 1585. until the 18. of June 1586. at which time they departed the Countrey; sent and directed to Sir Walter Ralegh". Old South Leaflets (General Series) ; No. 119. University of North Carolina at Chapel Hill. Retrieved January 17, 2011. ^ a b Fleming, Walter Lynwood (1909). The South in the Building of the Nation: History of the States. The Southern historical publication society. Retrieved June 3, 2011. ^ a b c d e f Miller, Lee (2000). Roanoke: Solving the Mystery of the Lost Colony. Arcade Publishing. ISBN 978-1-55970-584-4. Retrieved June 3, 2011. ^ a b Grizzard, Frank E.; Smith, D. Boyd (2007). Jamestown Colony: A Political, Social, and Cultural History. ABC-CLIO. ISBN 978-1-85109-637-4. Retrieved June 3, 2011. ^ Neville, John D. "The John White Colony". National Park Service. Retrieved October 8, 2008. ^ a b c Harriot, Thomas. Nina Baym (ed.). A Brief and True Report of the New Found Land of Virginia. The Norton Anthology of American Literature. ^ Zandt, Cynthia J. Van (July 8, 2008). Brothers Among Nations: The Pursuit of Intercultural Alliances in Early America, 1580–1660. Oxford University Press. p. 50. ISBN 9780199720552. Retrieved December 17, 2016. ^ Parramore, Thomas C.; Stewart, Peter C.; Bogger, Tommy L. (April 2000). Norfolk: The First Four Centuries. University of Virginia Press. ISBN 978-0-8139-1988-1. Retrieved August 17, 2011. ^ Strachey, William (1612). The Historie of Travaile into Virginia Britannia: Expressing the cosmographie and commodities of the country, togither with the manners and customes of the people. Hakluyt Society. Retrieved August 17, 2011. ^ a b c Gabriel-Powell, Andy (October 14, 2016). Richard Grenville and the Lost Colony of Roanoke. McFarland. pp. 118–120. ISBN 9781476626680. Retrieved December 18, 2016. ^ a b c McMullan, Jr., Philip S. "A Search for the Lost Colony in Beechland". The Lost Colony Center for Science and Research. Retrieved August 17, 2011. ^ a b Smallwood, Arwin D. (October 16, 2002). Bertie County: An Eastern Carolina History. Arcadia Publishing. ISBN 978-0-7385-2395-8. Retrieved June 9, 2011. ^ Hunter, Douglas (August 31, 2010). Half Moon: Henry Hudson and the Voyage That Redrew the Map of the New World. Bloomsbury Publishing USA. ISBN 978-1-60819-098-0. Retrieved August 17, 2011. ^ a b c d Stick, David (November 1983). Roanoke Island, The Beginnings of English America. UNC Press Books. ISBN 978-0-8078-4110-5. Retrieved June 9, 2011. ^ Warner, Charles Dudley, Captain John Smith, 1881. Repr. in Captain John Smith; Project Gutenberg Text; accessed April 1, 2008. ^ Lawson, John (1709). A New Voyage to Carolina. London. p. 48. ^ Williams, Gwyn A. (1979). Madoc, The Making of a Myth. Eyre Methuen. ISBN 978-0-413-39450-7. Retrieved August 17, 2011. ^ "The Croatan Indians of Robeson". Fayetteville Observer [SUBSCRIPTION REQUIRED]. February 12, 1885. Archived from the original on June 24, 2009. Retrieved August 16, 2009. ^ La Vere, David (July 2009). "The 1937 Chowan River 'Dare Stone': A Re-evaluation". North Carolina Historical Review. ^ "Ancient map gives clue to fate of 'Lost Colony'". Science News. The Telegraph. May 4, 2012. Retrieved April 30, 2016. ^ Price, Jay (May 4, 2012). "Old map offers new clues to fate of the Lost Colony". The Charlotte Observer. ^ Waggoner, Martha (January 19, 2015). "Researchers hopeful that NC site is that of Lost Colony". News & Observer. Associated Press. Archived from the original on January 22, 2015. ^ Hampton, Jeff (July 7, 2017). "Artifacts show Lost Colony settlers lived with natives". The Virginian-Pilot. Retrieved July 8, 2017. ^ "Family Crest on Sixteenth-Century Gold Ring Tentatively Identified". Roanoke Colonies Research Newsletter. East Carolina University. May 1999. Archived from the original on March 19, 2012. Retrieved December 17, 2016. ^ "Guide to the Croatan 16". ^ Duncan, Charles (April 11, 2017). "A simple lab test throws doubt on 'Lost Colony' theories". News & Observer. Retrieved April 11, 2017. ^ Lawler, Andrew (April 7, 2017). "The Mystery of Roanoke Endures Yet Another Cruel Twist". Smithsonian. Retrieved April 11, 2017. ^ Dolan, Robert; Kenton Bosserman (September 1972). "Shoreline Erosion and the Lost Colony". Annals of the Association of American Geographers. 62 (3): 424–426. doi: 10.1111/j.1467-8306.1972.tb00875.x. ^ Emery, Theo (August 11, 2015). "The Roanoke Island Colony: Lost, and Found?". The New York Times. ^ Stahle, David W.; et al. (1998). "The Lost Colony and Jamestown Droughts". Science. 280 (5363): 564–567. doi: 10.1126/science.280.5363.564. PMID 9554842. ^ Caroline Lee Heuer; Jonathon T. Overpeck. "Drought: A Paleo Perspective – Lost Colony and Jamestown Drought". Ncdc.noaa.gov. Retrieved August 16, 2009. Hariot, Thomas, John White and John Lawson (1999). A Vocabulary of Roanoke. Evolution Publishing: Merchantville, NJ. ISBN 1-889758-81-7. CS1 maint: Multiple names: authors list ( link) This volume contains practically everything known about the Croatan language spoken on Roanoke Island. Giles Milton (2000). Big Chief Elizabeth. New York: Farrar, Straus and Giroux. ISBN 0-374-26501-1. Critically acclaimed account, based on contemporary travel accounts from 1497–1611, of attempts to establish a colony in the Roanoke area. Milton is also the author of the 2013 children's fictional work, Children of the Wild, which tells the story of the colony through the eyes of four English children. Wikimedia Commons has media related to Roanoke Colony.